Amy Gosman is a fellow mom at my son's school and a baker extraordinaire. She's from New Zealand and makes a killer Pavlova that somehow makes some of my least favorite things - tropical fruits and meringue - into, as she calls it, "the dessert of the Gods." One of the myriad commemorations of the end of the school year is the beach trip to Heart's Desire. 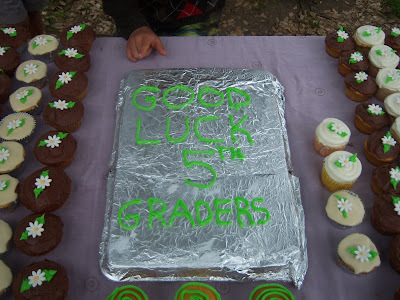 The day includes an always-teary ceremony to honor the outgoing 5th graders, and cupcakes for more than 200 kids. Amy was once again in charge of the cupcake portion of the day. Last year she assigned icing colors to each of her delegated bakers to create a giant cupcake rainbow. 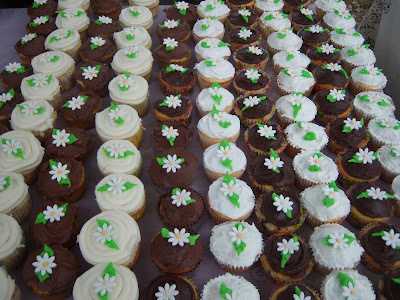 This year, she got it into her head to make 240 daisies from gum paste and royal icing to top each of the cupcakes. 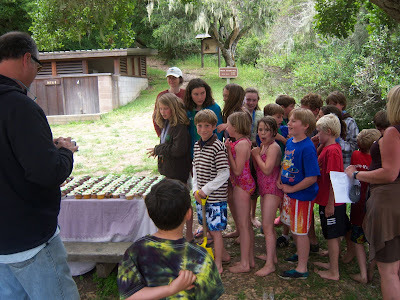 But, Amy's older daughter had a field trip to Stinson Beach on that day - so she dropped of a box of daisies and a locked 'n' loaded pastry bag with her pal Susan with a quick lesson on how to make the leaves. 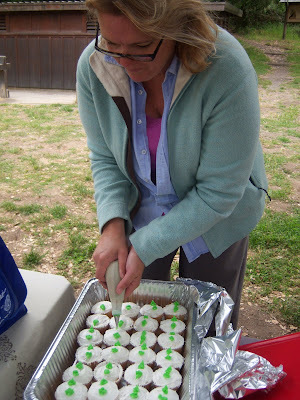 Susan did an awesome job - but it was a LOT of work, especially while the icing was still stiff and cold. Max is 5th in line - that's my boy! Wow, look at all these beautiful cupcakes!